Again…I Say Rejoice! | Lord...What's My Motivation? Why is it that every time I want to rant about something…every time I find an opportunity to get nasty….every time I need to vent about how badly I was wronged….something swoops down and dissolves the mood? Can you believe I’m complaining that I can’t find an opportunity to be upset. That’s irony folks. First and foremost, in the spirit of spreading joy…. Chick-O-Sticks….ever heard of ’em? I’m finding that alot of people haven’t. This is probably the most under appreciated candy bar ever. (I’d rank it up there right next to Jelly Beans as MOST under appreciated candy of all time. Not Jelly Bellies….darn that stupid buttered popcorn!!! !…..Jelly BEANS.) But, Chick-O-Sticks….I love them. They have a delicious, crumbly crunch and wonderful peanut butter taste, toasted coconut….they’re orange and have nothing to do with Chicken as the name would imply. Stinkin’ awesome. I find that if I keep one of these timeless puppies in my glove compartment…on those days when you just don’t know how to deal with life….a Chick-O-Stick makes life a little bit sweeter. (Figuratively and literally.) I don’t expect you to rush out and grab one, (But if you do, get me one!) but I would ask that the next time you see one….try it. You know what else makes me happy. 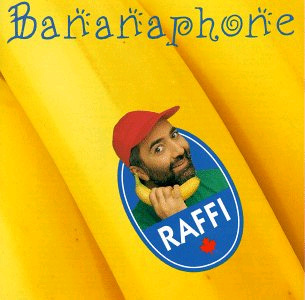 Seriously…RAFFI’S “Banana Phone.” It’s a stupid little children’s song that I happened upon when two of my students did a musical number routine to the song in full banana costumes for their Thespian Society inductions. I downloaded it and reserved a corner parking spot for it on my iPod. On shuffle, every now and then, I’ll stumble upon the song, and it instantly puts a smile on my face. I love my dogs. We have four total. Two are officially Emily’s (because, quite simply, she’s laid claim to them) and two are mine…because they’re not Emily’s. Actually, that’s not totally true. Penelope the Pug is all mine. (A birthday present from 7-years ago.) I love her so much. She’s so…..simple. Like her papa. Everything is always brand new to her. There is never a clever moment for this pooch…and as they say, ignorance is bliss. She’s wild, snugly, noisy…and she’s all mine! My other joy is Beatrice. 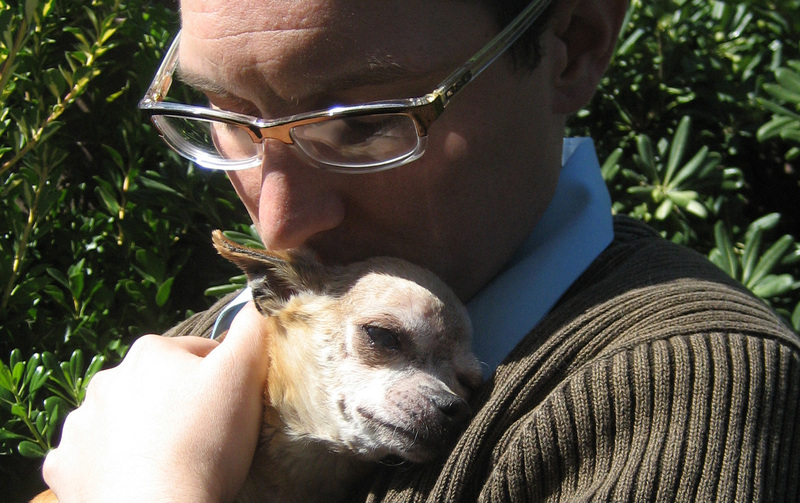 My 12-year old, blind, toothless, diabetic Chihuahua. She carries on like a headstrong senior citizen and shuffles through her every day with her little tongue sticking out. She’s my gummy bear. Dogs are funny. They’re completely dependent on you, they are loyal to the max, and they bring you such joy…a joy that cannot be described. I’ve actually talked to my dog while snuggling with her on the couch. Have you ever done that? At first you think to yourself…”what am I doing?”….then you figure “who will ever know?…then you realize “she’s actually listening to me.” Dogs are special because they do listen. They don’t know what you’re saying, but they will respond. Try to find another living thing that will immediately respond to you without hesitation or agenda, every time you look them in the eye. I look at my dogs in new ways everyday because of that. I love performing. 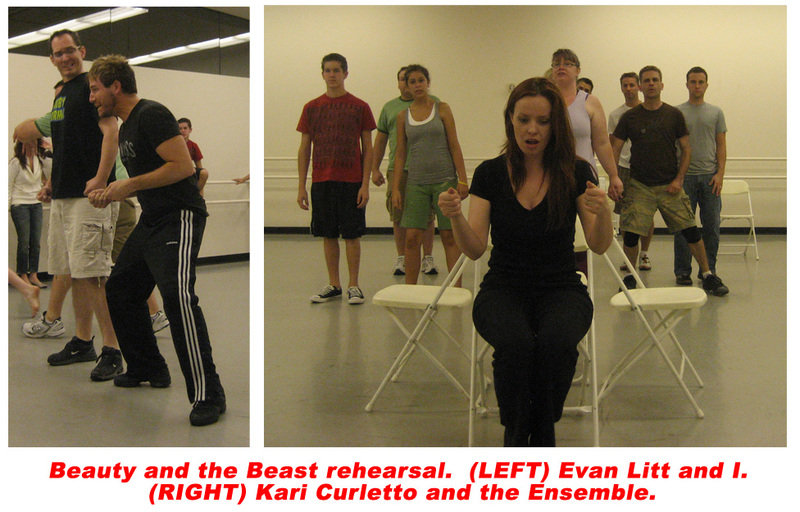 Yesterday we had a weekend rehearsal for “Beauty and the Beast” which is opening in a week out at Summerlin Library and Performing Arts Center. Click here for more info. (Hope you can make it!) Let me tell you something…trials and tribulations aside, there is something special about theatre. I was sitting next to my friend Kari (she plays Belle) and we were watching a scene onstage, and we talked about how there is nothing like theatre. Where else do you take something REAL, scale it up or down, dress it up really pretty, dissect it, analyze it…and then try it on for size…and then offer it to a willing audience? Where else can you find such raw dedication? (And the funny thing is, the audience accepts it!) There is just something magical about it. When two set piece are put together and suddenly you have castle doors. When a lighting effects stretches the imagination, and suddenly you’re in the woods. When a shift in dynamic accented with music, evokes emotions and suddenly the audience is a part of the “mob scene.” Dang…I love it. It’s hard stinkin’ work putting up a show. Time, effort, money…patience. Sheesh. But, at the end of the day, it’s something that was a part of you…and a part of the audience. You can never take that away. I’ll never be a pirate…but for one night I was Captain Hook. I may never see the Broadway stage, but for one night I was a choreographer in a chorus line. I may never be a gallant suitor…but for one night, I climbed a castle and fought a Beast! As long as I live, theatre will be very, very close to my heart. I love my students. I have six classes, and I approach each of them VERY differently. Even the two sections of High School Drama…talk about different personalities and atmospheres. I always find it interesting how the time of day plays a huge part in how students approach work in class. Last block before they go home, for instance is very different than second block right before lunch. Teaching has its own rewards…especially in the way that it keeps you on your toes every second of every day. My Advanced Drama class is a unique one this year. It’s kinda hard to explain…allow me to try. 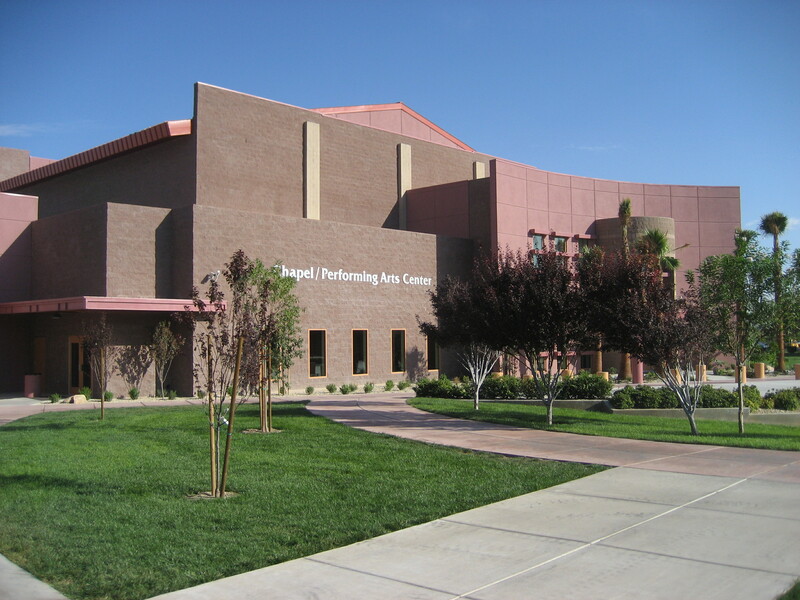 Imagine a class of Juniors and Seniors (all of which you know very well…most of which you’ve worked with before onstage) and now put them right next to a group of students who may not have as much experience in performing, but NEED Drama class, because they are wildly creative people with passions that need to be expelled. (Hey! There’s chocolate in my peanut butter! No, wait! There’s peanut butter in my chocolate!) Anyway…all of these kids I care about very much…but I’m finding myself struggling with them more than any other class. Not because they are bad, mind you. To the contrary…they all want to be a part of something good…and fun. But in heir varied (sometimes impulsive) efforts, the true ensemble effort gets lost in translation and the result is two camps…..ultimately generating two philosophies. On one hand we have students who desperately want to WORK…..gnash teeth if necessary….to bring their craft to the next level. On the other hand, you have students who want to perform…and have fun doing it. Both groups want to be successful…but neither want the other group to “get in the way” (for lack of better words) of their efforts. A lot of the class/scene work is given a group, “ensemble” grade. Over the last few days, we’ve had to forgo the usual lessons to actually sit down and talk, as class. (Something I think is WAY underdone in classes today.) The results were very good. Everyone was forthcoming, everyone had an opinion…and now we’re working toward a better tomorrow, together. Will it be perfect? I don’t anticipate that. But I do know this…where else can a teacher go to a “troubled” class and sit down with them…look them eye to eye, collaborate, and together….regroup. 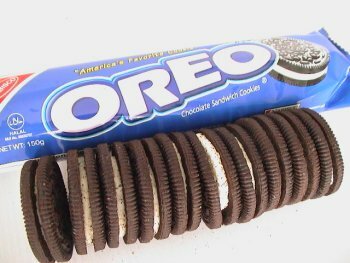 Even MENSA meetings wind up in arguments over why the Oreo cookies should be arranged in vertical rows and who owns the second series of NUMBERS. You see…I love my job. I know that, as a class, we’ll get there…and we’ll do it together. If we have to trample on the “routine” of teaching that class, and approach this self-disciple in a weird, awkward way to do it….so be it. I’m ready, and I have the privilege to work with students who WANT to get ready too. I could go on: Grandmas, my wife’s smile, the smell of freshly cut grass and freshly pumped gasoline (I know, I’m a freak)….and there more! Plenty of stuff I have to be thankful for, and find great joy in. But I would like to end by mentioning something that I presented in a Children’s Chat at church today from Philippians 4:4-13. This scripture, which details the message Paul wrote from prison, reminds me that even in my darkest moment I can find peace in the Lord. I can turn to prayer and know He will hear. I have plenty to be thankful for and a multitude of things in my life that bring me great joy. But, I admit, I have sad moments…I hang my head low and think sad thoughts. During these times it’s a great comfort to me that the Lord is listening and He will help me cope. This entry was posted on October 12, 2008 at 2:18 pm and is filed under FAITH, FAMILY and FUN, LIFE IN GENERAL / RANDOM RAMBLINGS, THE HIGH SCHOOL THEATRE CLASSROOM with tags Advanced Drama, Bananaphone, Beatrice, Beauty & the Beast, Chick-O-Sticks, Chihuahua, CPAC, Ferris Bueller, happiness, happy, Jelly Beans, Lord, Penelope, Pug, rejoice, sad, sadness. You can follow any responses to this entry through the RSS 2.0 feed. You can skip to the end and leave a response. Pinging is currently not allowed. I love that you take the time to regroup, alot of us just keep plowing along until they can’t anymore and then the things that make us feel good all over become another weight on our shoulders. I think I will list the “Love” things in my life and regroup. There are so many things that are waiting for me to do, and sooooooo little time. I love your blog. Your honesty, your insight, your humility, and, yes, your craziness are why you are one of the most effective educators that Ihave ever worked with.